Today I dropped by. He has the cam timed and was assembling the rockers. The support for the rocker shafts is most impressive! There is a short shaft for two valves each. I have to order a 1.5" spacer for the power steering pump now. He's hoping to get it running tomorrow. Yes, it is ok, but not as accurate as the positive stop method. I took a better look at the dial indicator today and he was reading it off a pushrod. Looked to be pretty accurate I should think. The positive stop method is to find "True TDC", the best way to find "True TDC". A dial indicator is ok, but the piston sits still for a few degrees before and after TDC. Readings off a pushrod would have been while reading the camshaft. 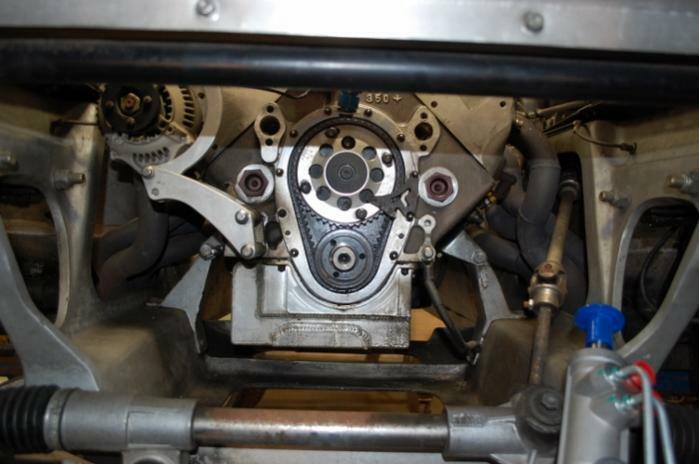 Have you got some photos of the build, especially the camshaft timing setup? Last edited by Gaz64; 05-25-2018 at 04:05 PM.. I see what you mean by sitting at TDC. I believe he did go past and come back and take the center position. I'll see about getting some pics. I could use some myself. I didn't hear it run yet but here are some more pics. Is there a plastic cover for the timing belt? No. It is mostly covered by the water pump but the seal is behind the big pulley. When everything is in place you can touch the top of the belt from straight above if you wish. I suppose if the belt comes apart it keeps the debris out of the oil...? 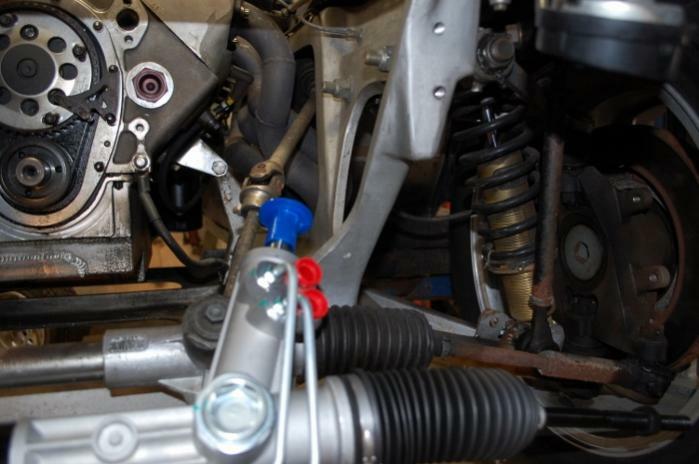 It looks like the front suspension "cradle" is cast aluminum ?? Who does that for a "one-off" or very low production # vehicle ? Definitly a purpose built car. How did you ever find it? Yes, that is the SVE part, impressive isn't it? I am told they had it cast locally. Herb and Matt Adams built a number of these cobra replicas in the Monterey area back around 2000 to 2002 or so, and sold them... or more likely built them to order. I have found three or four total so far. Matt Adams is quoted by a member here as saying they built some 20 Cobras though I have not been able to find very many. The car is pictured or mentioned many times in Herb's book on chassis engineering. The way that the car is constructed is very focused and uses proven competition quality elements all through it. Between the first two owners I have receipts for $174,000 to build and develop it. I corner weighted it and found with a half tank of gas (22 gal tank IIRC) it weighed 2,063#. Doing the calculations I found with me in the drivers seat the car has perfect 50/50 weight distribution with a bit more weight on the left. With a person in the right seat it is a little heavy on the right. 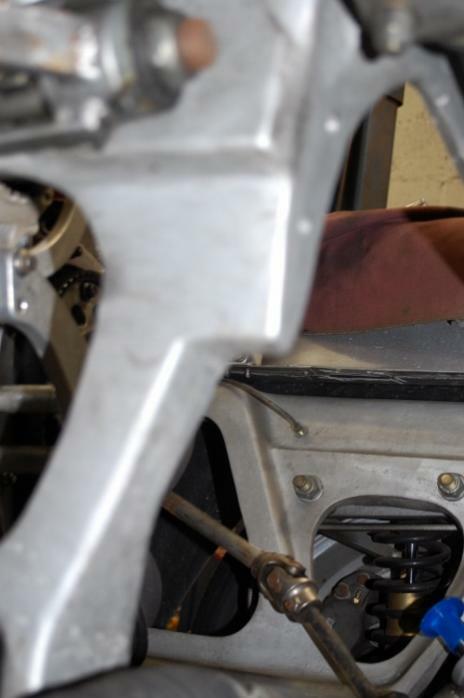 In addition to getting it running we have changed the master cylinder for the front brakes using the engineer at Tildon braking's advice on the size, and we are adding T-bird style power rack steering. We'll also be replacing the seats and adding a roll bar....oh yes and a rev limiter compatible with the Joe Hunt magneto. I plan to autocross it and use in good weather on the street. In looking at the car it is hard to find anything to reduce weight as all ancillaries are aluminum if available and minimalist. Indeed it appears as if whenever a part needed to be chosen the builders could have gone to the most expensive part and bought and installed it. As far as finding it I really just fell into it. I had gone off on one of my usual mid winter car looking jags....looking for information about the Kellison coupe for sale in Indy that I was seriously considering and came upon this car. (Thank goodness I bought this instead). The aluminum chassis definately caught my eye. Finding it was built by Herb Adams also was a big plus. I believe it to be a very special car but due to marketing it inappropriately I was able to buy it for the price of a much less exotic Cobra replica. It was running very poorly but with the assistance of my excellent local race chevy shop I was confident we could get it running right. I can't wait to get it on the autocross circuit! Last edited by t walgamuth; 05-28-2018 at 08:51 AM.. I would like to extend the filler to the outside of the car so I don't have to worry about fumes in the cockpit. 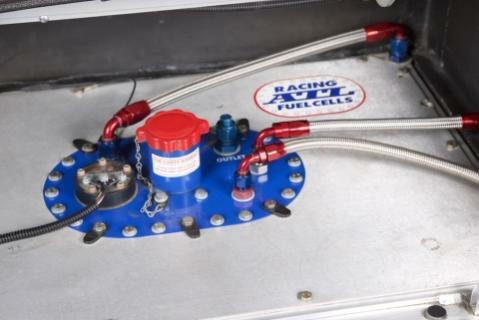 Has anybody done this with an ATL fuel cell? All timing belts run in a dry environment, but they are protected from the elements and foreign debris, by a plastic cover. If the belt did ever fail, it could be the end of the engine. I'll have to find out if it is an interference design. 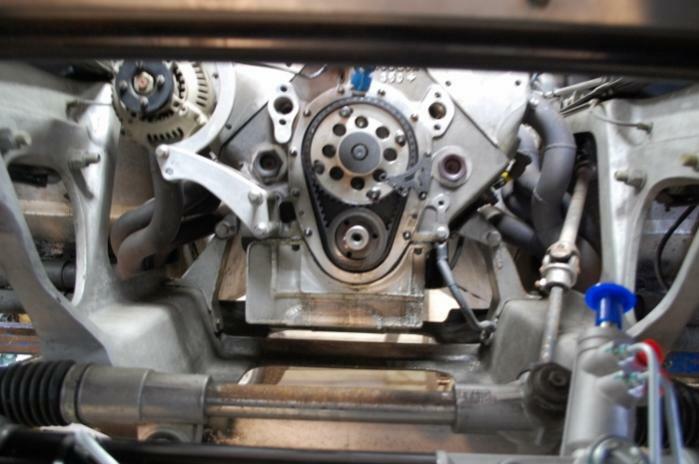 The timing belts in a volvo street car are pretty open. A lot of race cars run these belts for the oil pump and water pump, I've never seen one with a belt guard. Not that its not a good idea, but apparently having them open works pretty well on a race car. Factory timing belts are covered for owner safety and debris, to get some longevity. Timing belts are also more critical, since a failure generally means bent valves, where as ancillaries with belt failure gives you a chance to shut the engine down, and it may be ok. I class just about any engine these days as interference. There was a recent thread about making a custom built fuel tank and Morris provided some pictures of how he plumbed his fuel cell to be filled from outside the car in the normal manner. I have had very limited time behind the wheel, but raw gas fumes were definately there. I also worry about spillage inside the trunk. The exhaust is side outlet though I wish sometimes for an under car setup. Interesting background on your car. I had never heard of a VSE Cobra before. You're fortunate to find a car perfectly suited to your intended usage ! Keep us informed as you progress, and best of luck on the track ! Thanks guys! Its nice to have others appreciate it too. I realize you're in a totally different jurisdiction, but the in-trunk filler would never be approved here (Saskatchewan, Canada) for street use. 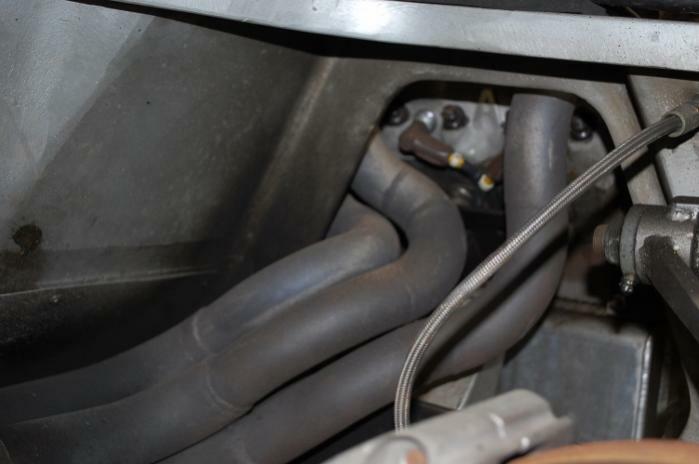 Quick thought: Make sure you're using tubing approved for gasoline when connecting it to an external filler - unlike the radiator hose that I found in mine when I bought it. Hard to imagine it was legal to drive in California and not Canada! Yeah, I'll verify it is rated for gas.